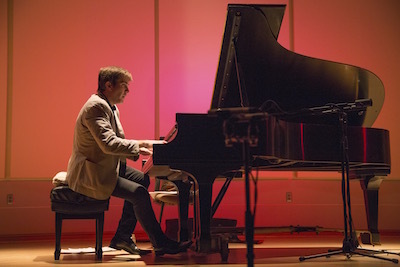 The electrifying pianist Blair McMillen opened NMNC's season, playing works by Don Byron, John Cage, and David Rakowski, including some for toy piano (Cage and Rakowski) and for vocalizing pianist (Byron). 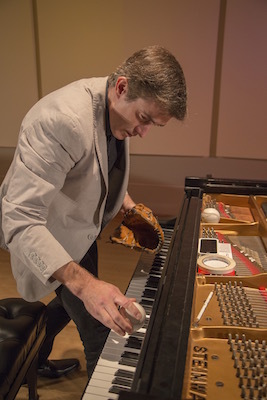 Then Blair delighted the Sainer audience with a truly unusual piece: Annie Gosfield's Brooklyn, Oct. 5, 1941, played (both on the keys and inside the piano) using two baseballs and a fielder's glove. 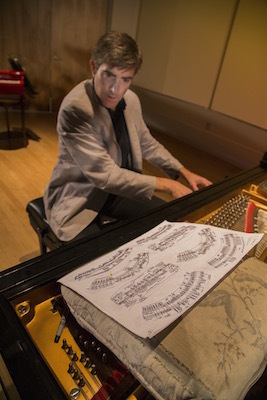 He concluded the concert with eight movements from George Crumb's dramatic Makrokosmos Book 2, using a range of extended techniques and bringing the audience to its feet. While in residence Blair met with New College music students and gave a lecture/demonstration at Booker/VPA High School to about seventy students there. 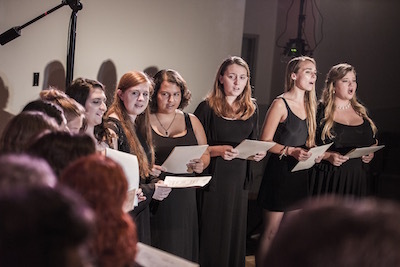 The New College Chorus, directed by Virginia Bray, was featured in our second concert. 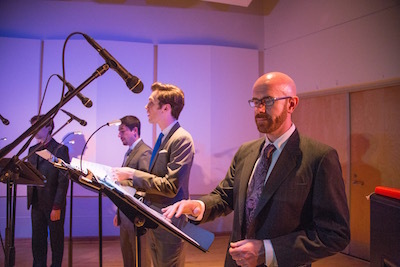 NMNC Director Stephen Miles led the chorus for the first two works, Meredith Monk's rhythmic and rousing Return to Earth and R. Murray Schafer's meditative Epitaph for Moonlight, which uses a graphically notated score. 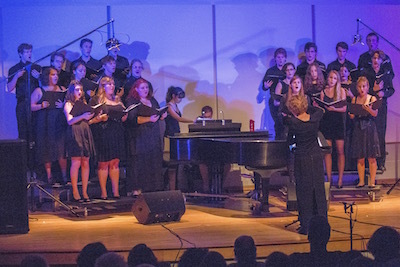 Bray then led the Chorus, comprised of New College students and accompanied in this piece by piano, in Sure On This Shining Light by Morten Lauridsen. 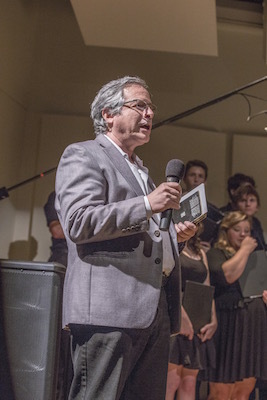 Before the final piece of the concert, Ola Gjeilo's haunting Dark Night of the Soul, New College Professor José Alberto Portugal spoke about the text Gjeilo uses in the piece, the poem "Dark Night of the Soul" by St. John of the Cross. For the Gjeilo the Chorus was joined by a string quartet (Nathan Frantz on viola, Leo Labrecque on cello, and Matthew Dendy and Roxane Frangie Solowey on violin). The piece started with driving rhythms, became quiet and contemplative, then brought back the opening propulsive force before finishing with a final meditative calm. 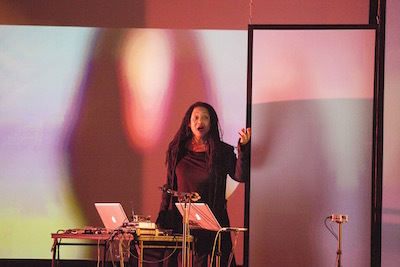 Pamela Z returned to NMNC to present an evening of works involving electronics (often controlled by her body movements), video, and of course her phenomenal voice. The first half of the concert included shorter pieces: Flare Stains, which she built using her voice and the ting of a tuning fork into a dense aural tapestry; then the inspirational (literally) Breathing from her 2013 evening-length work Carbon Song Cycle. In both Breathing and her next piece, Unknown Person (also from a longer work, in this case her 2010 Baggage Allowance) Z used electronic sensors that used her body's motion to direct how she processed the sound of her voice. 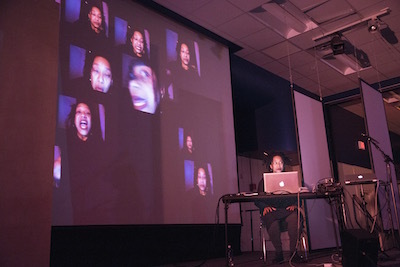 In 16 Actions a multiplicity of Zs filled the screen behind her, with gestures and sounds captured by her laptop. She followed this with an improvised piece and then her interpretation of Meredith Monk's Scared Song. The evening ended with Memory Trace, a new work-in-progress about various aspect of the concept of memory. 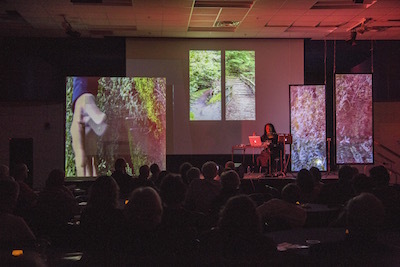 For this Z (with assistance from NMNC Producer R. L. Silver) constructed a number of projection screens on the Club Sudakoff stage and had multiple video projections accompanying her vocals and processing. Provocative and moving, the piece dealt with not only how we remember but how we fail to remember. 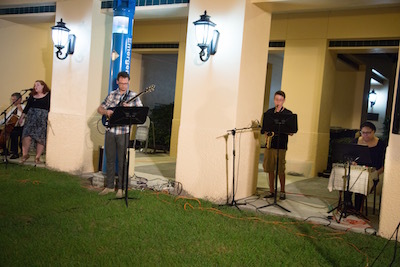 For our March concert we moved outdoors to the PepsiCo Arcade and, in a first for NMNC, surrounded the audience space on all four sides with musicians. Twenty-five musicians, to be exact: brass players, woodwind players, string players, keyboard players, and vocalists all joined in to perform Terry Riley's minimalist classic In C.
The concert-length piece has all the players reading from the same music—fifty-three short melodic patterns that they each play in order, synced to a common eight-note pulse on the note C (played in octaves by our helpful NMNC iPad). The beauty of the piece is that each individual performer decides when to begin each pattern, how many times to repeat each pattern, and how long to pause between the end of one pattern and the beginning of the following one. Thus one fixed collection of melodic material generates an entirely new piece every time it's performed (or even rehearsed). The players included students, faculty, and staff from New College; students from Booker Middle School, State College of Florida, and USF in Tampa; and members of the community from Venice, Sarasota, and St. Petersburg. And, just as the players each had an amount of agency in how they progressed throughout the piece, audience members had agency in choosing how to frame their experience: people could sit or stand in one place, or wander throughout the Arcade to listen to the various combinations of timbres, melodies, and rhythms, or even walk beyond the confines of the Arcade to observe the totality of the playing from a slight distance. 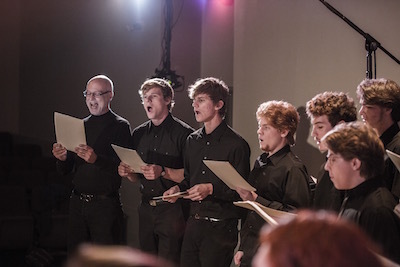 Every concert this season (even pianist Blair McMillen and Inside InC) featured some vocal music, so it was fitting that we concluded with Ekmeles, an ensemble dedicated to exploring the entire range of sounds the human voice can produce. 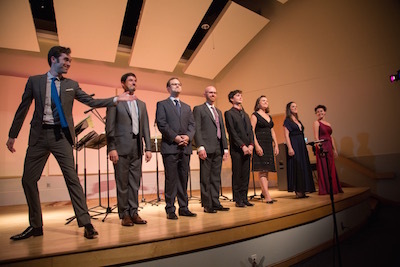 Ekmeles—sopranos Jane Sheldon and Mary Elizabeth Mackenzie, mezzo-soprano Rachel Calloway, countertenor Patrick Fennig, tenors Tomás Cruz and Eric Dudley, baritone (and Ekmeles director) Jeffrey Gavett, and bass Steven Hyrcelak—performed four very different pieces. 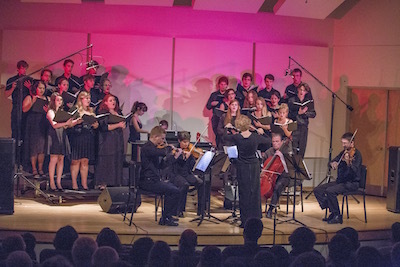 They began with Giacinto Sceisi's Tre canti sacri, which uses microtones to defamiliarize sacred texts and create a new spiritual and moving work. 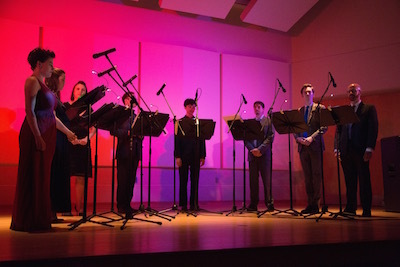 Then six members of the ensemble performed Claus-Steffen Mahnkopf's theatrical void—un diletto italiano—Un epitaffo, written as a musical response to the murder of filmmaker Pier Paolo Pasolini. 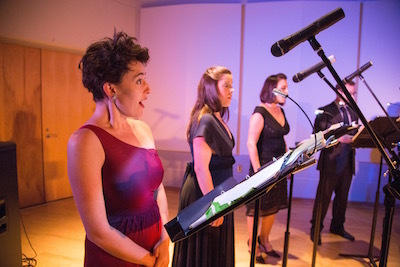 The piece includes gasping, screaming, and declaiming in addition to much precise singing. Ben Johnston's four Sonnets of Desolation came next, using text by Gerard Manley Hopkins and sonorities based on pure overtones (instead of the more commonly used equally-tempered pitches). The concert concluded with a piece that really stretched the range of the voice as well as the discipline of the performers, Aaron Cassidy's A Painter of Figures in Rooms. Instead of standard musical notation this piece instructs the performers how to shape their mouths and produce the various sounds the composer calls for. There were percussive sounds, sustained sounds, pitched, guttural, and breathed, and a disquieting very long silence in the middle of the piece, when you could hear a pin drop as our audience watched in rapt attention. As the cascade of sounds stopped precisely on cue at the end of the piece, the audience took a breath and then broke out into a loud ovation. While in residence Ekmeles met with New College music composition students to discuss the realities of getting new compositions performed. This season was sponsored in part by the State of Florida, Department of State, Division of Cultural Affairs and the Florida Council on Arts and Culture.